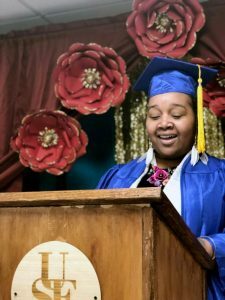 On Friday, December 14, 2018, the most recent class of Training for Office Jobs students graduated from the program at United South End Settlements. Graduate Jade Gardner gave an amazing speech during the ceremony – read the full text below! We’re going to play 3 questions! That same women gives up bikinis at age “48”! – Who knows the truth in that, right? My name is Jade Gardner, I am 32 years old, and I am a mother. To begin I would like to thank the Timothy Smith Network for this opportunity and its resources. I would also like to thank the following USES staff members- Mrs. Adella Ryan, who worked with us every single day, taught us what we needed to learn in this course whose efforts went above and beyond just an instructor, but someone who also cared about our success! Joel Nitzberg, for your consistent help and facilitation of my learning of soft skill soul-searching process (as I like to call it). Melody Valdes, for your refreshing knowledge, coaching, and amazing mentoring ability. Abe, Christina, Lee, and the other students and everyone that assisted us in this process, for your knowledge, and diverse perspective. To My Family, thank you for everything. I would like to start by briefly speaking on the blogpost Flourishing of a Woman. “The Flourishing Woman is dedicated to inspiring women to fulfilment: whether as a woman, a wife or a single lady, we believe every woman can overcome personal barriers, grow resilience in pursuit of her purpose and go on to live the great life she’s created to live”. Secondly I would like to note that education is the process of facilitating learning, or the acquisition of knowledge, skills, values, beliefs, and habits. During the TOJ program, after being out of school for over 10 years, there was an adjustment that I had to make in order to feel like I was even able to participate and keep up with a learning environment. Our diverse group of women was actually refreshing and gave me the reassurance that no matter who you are, what stage of womanhood you are currently in, that if you really wanted to make a choice and a sacrifice to better your future, this program gave you that platform to do so. We learned Microsoft Word, Excel 2016, Mavis Beacon Typing. We took all kinds of assessments throughout the cycle tracking our progress on Northstar. We had lesson assignments, assessments, projects and Class Projects. I literally have a binder that weighs about 5 pounds full of information, packets and handouts. All of which will be of resource throughout our professional career and more! Educational methods include storytelling, discussion, teaching, training, and directed research. I am a believer that you learn equally as much from a persons’ story, their perspective, and perception, as you do from a textbook. The beauty of this experience is that you get all of that in one. I believe that higher education is really a test for a person’s character, strength and resilience and is something that you truly deserve to be proud of. Education can take place in formal or informal settings and any experience that has a formative effect on the way one thinks, feels, or acts, is considered educational. Soft Skills, oh my goodness! Those were not soft skills to me. More like hard, rough, tricky skills. The definition of soft skills is personal attributes that enable someone to interact effectively and harmoniously with other people. I did not even know there was a definition for this that is how out of touch I am from this subject. This was definitely an experience that has taught me a lot and I truly thank USES for this awakening. Believe me when I say soft skills are equally as important to hard skills professionally and personally. Thank you for your training, workshops, helpful handouts and expertise! Finally, in the 1940’s, women in the United States advertised products to gain weight and thus become more ideally curvy and beautiful, “Men wouldn’t look at me when I was skinny,” said one advertisement. “but since I gained 10 pounds this new, easy way, I have all the dates I want.” This passage really stuck with me, as this is my interpretation of women today. We present ourselves with many jackets and personas; some larger than others, thus we become seasoned and educated. Before past-experiences and before education my jackets appeared skinny or small. After this experience, I have yet another jacket to fill. Value your worth and the power of family, support, and education. Congratulations everyone!